The truck is an International 8600 with a C13 Cat engine and an Allison transmission—it can haul anything. That box has my motorcycle in it, and then we have a 35-foot fifth wheel. 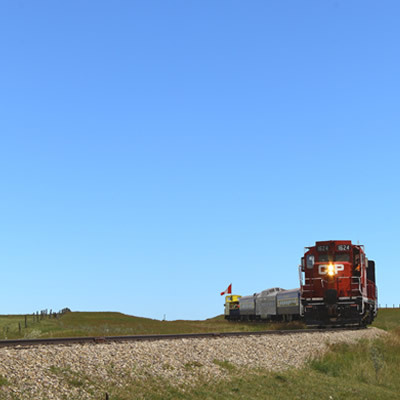 We’re 55 feet in length, and it takes a Class 1 license to drive this unit. There are seven of us travelling together: my son and daughter-in-law—they have their own RV—myself and four grandchildren. I’ve ridden this area numerous times on a motorcycle, and it’s a beautiful area to ride. This time, though, we just stopped for fuel and for coffee. Where else have you been on this trip? We were in Penticton for two weeks, then went to Sundre, Alberta, and also to Drumheller to see the dinosaur museum. The kids were thinking they were going to see Jurassic Park, so it wasn’t quite as big a hit with them as we hoped it would be. We made a stop in Vulcan, of course, because we’re all Star Trek fans, and then to Head-Smashed-In Buffalo Jump. We’re heading down to Silverwood (Theme Park) in Idaho. 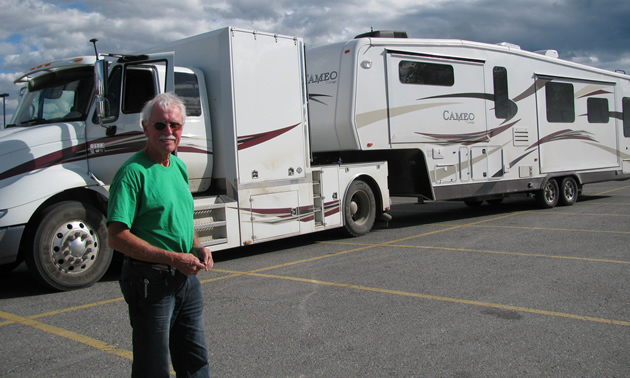 Gary and Laura Beswick enjoy discovering Vancouver Island in their 30-foot fifth wheel.